After the now imminent release of Red Dead Redemption 2, there’s little doubt that Cyberpunk 2077 will undisputedly become the most anticipated game in development. The latest PC Gamer magazine (December 2018, issue 324) features an interview with some CD PROJEKT RED developers. Writer Stanislaw Swiecicki explained how the game features strong elements from both sides (Robocop and Blade Runner, for example) of the cyberpunk genre. Some cyberpunk is more pulpy and driven by action. Stuff like Terminator and RoboCop. But then there’s the more philosophical side of the genre. Think Blade Runner or Ghost in the Shell. Our mission is to give players strong elements of both. You’ll experience the thrills of using cybernetic implants and high-tech weaponry in combat, sure, but there’s also depth in the story. We want to ask questions about what identity and individuality are in a world where people are so closely connected with technology. Storytelling is hugely important to us as a studio. We want to tell stories that resonate with people on an emotional level and ask important questions. So there will be a lot of that in the actual game. It’s an important part of the genre. 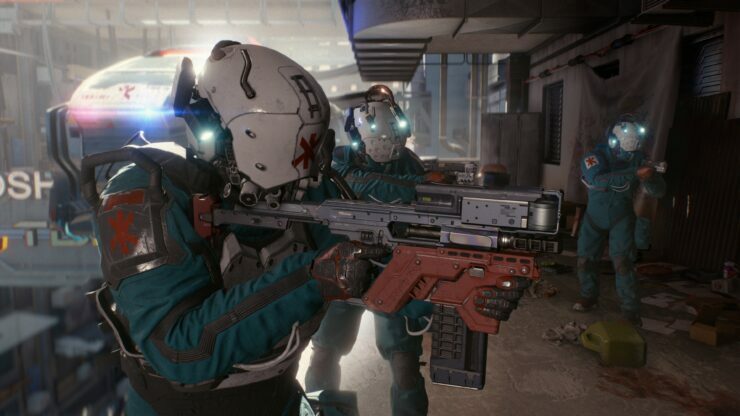 Quest Designer Patrick Mills, on the other hand, was able to confirm that Cyberpunk 2077 includes a certain degree of emergent gameplay allowing for player creativity. There is room for emergence. It’s not exactly The Legend of Zelda: Breath of the Wild, but it does happen. We’ll build something imagining players doing it in a certain way, but QA will play it and say: ‘I should be able to do this’. Then that gets added, and the complexity increases. So interesting stuff emerges more from the logic than the systems. He also said that the game’s setting is a game-changer compared to The Witcher when it comes to quest delivery. Having a setting with telecommunications makes all the difference. It’s also more immersive. How do I get a ‘quest’ in the real world? Usually it’s a phone call or text message: ‘Can you go pick up groceries?’ Our open world team is constantly filling the city with little events that can feed into quests. You’ll see some dudes on the street, and eavesdropping might lead to a quest. Or maybe because you talked to them, you might see them a couple hours later in another quest and get some reactivity there. Cyberpunk 2077 has no release date yet, but we do know it’s being made for PC and current generation consoles. In fact, CD PROJEKT confirmed recently that the optimization process began at the very start of development.